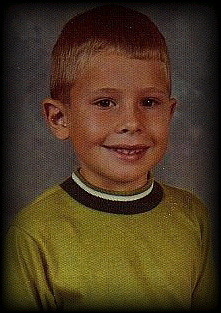 I began grade school at Corpus Christi Catholic school on Evansville's west side. My teacher, Dorothy Sahm, 54, was a nice lady but scared me. I'd daydream and she'd call on me, or I'd forget to do homework and she'd ask me where it was in front of the class. I froze. It was humiliating. I was awkward, shy, and tried hanging out with my older brother as we'd done at home. I was soon told by my parents that I needed to make my own friends. I stayed inside for recess when I could, to write or draw. I wasn't loud and animated like the other boys and avoided conflict. Nevertheless, children in my class liked me. I was extremely well behaved, polite, could write and draw, and my grades were very high. I was the best male speller in the class and wrote stories which would sometimes be over 30 pages long. Mrs. Sahm asked to keep one of the photos of John Kennedy I'd drawn. I liked drawing him...he was my parents' hero. Eight years later Mrs. Sahm was in the news...her daughter, two grandchildren, and son-in-law (the Gilligan family) were murdered by Donald Ray Wallace (executed March 10, 2005). Then in October 1995 we met at Deaconness hospital for the first time in 22 years. She was 75 years old. I asked if she remembered me...she wasn't sure. I got down on my knees, looked up at her and said,"How 'bout now?" She remembered. I sent her a birthday card that year and she died in 1999 and is dead to this day...she never returned the Kennedy picture. My relationship with baby sister, Brenda, soured. Quite simply, I became jealous of her and as a child of seven is ultra-sensitive to fairness, I felt she was getting preferrential treatment. I saw a double standard and I hated her.